A new study shows a growing market for wood in interiors. 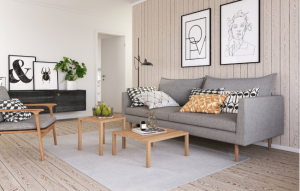 More people want visible knots in wood flooring and wall cladding than want knot-free wood; many prefer pine for their wood floors; the majority want wood in one or more places in the home; and style preferences for interior design are relatively similar across Europe. These are the conclusions of a new study on interior pine products in the home. The organisers of the study are industry organisation Swedish Wood, Linköping University and Luleå University of Technology. The study was conducted as part of the research and Swedish innovation programme, BioInnovation.